Registration is now open for the 2018 Durham Nepal Study Days (Nepal Conference) 16th-17th April 2018. All paper givers, chairs and general participants must register to attend the programme in Durham. Conference abstract book will be posted here. Registration costs £25. 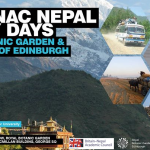 BNAC membership allows you free participation in all BNAC events including Nepal Study Days (saving you £25 registration fee at the NSD, but there will be a small contribution towards lunch to be paid). Annual Associate and Ordinary membership fees are £15 and 30 respectively. £3 and £6 discount is available for renewal through standing orders/direct debits for associate and ordinary members respectively. To become a member please visit http://bnac.ac.uk/membership/). To pay registration or membership fee online, please contact Dr Celayne Heaton Shreatha (Treasurer celayne.hs@gmail.com). Please visit our website (www. http://bnac.ac.uk/) for updates and further information. We are very much looking forward to your presentation and please do not hesitate to contact us when you have further questions.